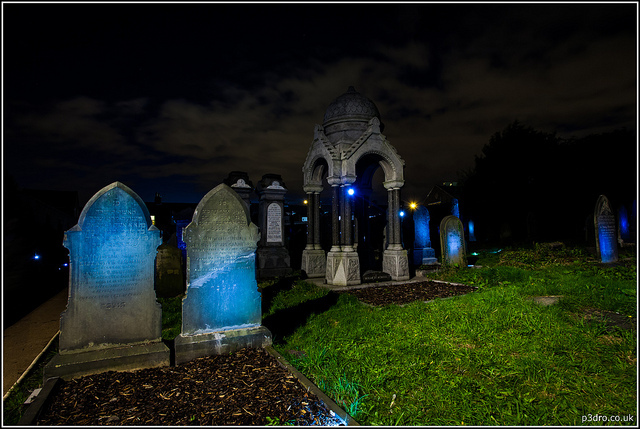 The cemetery is located in Liverpool and has been recently granted money to restore the Jewish plot. A good thing too as it’s another piece of history that we shouldn’t let go to waste, well that and of course there’s always a good ghost story or point of interest if I’ve dug it up to read about right? The Dean Road Cemetery is a burial ground that has been used for numerous Jewish families dating back to the 17th Century. It fell into disrepair sometime in the 18th Century, and residents around the area have said they heard children’s screams in the middle of the night or in the houses the doors slammed and furniture would sometimes be found moved without explanation. Some of the older houses on the street may well have been part of the slave trade, slaves were undoubtedly kept in some horrific conditions in larger homes as the basements could be used to keep them away from prying eyes during the 198th Century. There have been reports of screaming, scratching sounds, loud footsteps, doors shutting and locking… and even possession. The Ouija boad is registered trademark of Hasbro Ltd. It’s marketed as part of it’s line of board games. The Ouija board has a set of letters, numbers, yes, no, hello, goodbye and there is a planchette to indicate a spirit’s message on the board during a séance. It was commercially released by a businessman Elijah Bond on 1st July 1890. The board was regarded as a harmless game until American Spiritualist Paul Curren used it as a diving tool during WW1. Despite being repeatedly debunked y the scientific community they are still widely believed to work, and condemned by many Christian’s as a tool of the Devil. Looking for films with the Ouija board in them? Paranormal Activity (2007), Repossessed (1990) The Exorcist (1973) and Thirteen Ghosts (1960) are a sample to start with. My mother had a personal experience with the Ouija board, she said that her and her friends tried. The answers, she felt, were something that no one but her grandmother would know. Regardless of what I believe if my mother felt it was something she didn’t feel safe around I wasn’t going to argue and for that reason I have never experimented with one, nor will I.
this Zozo thing has me skeptical in that it strikes me as another wonderful ploy to get a film or something, however unlike Slenderman they are genuine with the claims and the more people see it the more they are likely to fall under the spell. A doll that was once owned by Key West painter and author Robert Eugene Otto. It is allegedly cursed and is a feature in the Fort East Martello Museum. He resembles an early 20th century American Naval Officer. The doll’s hair is not made from human hair, it’s made from a synthetic material, but that’s another lovely rumour. Eugene got the doll from a black slave, the slave was displeased with the family and at first the parents thought he was talking to the doll and then answering in a pretend voice. However the doll may have actually been speaking. Neighbours claimed to have seen it move from window to window when people were out. In the night Eugene would scream and his parents would run in to find furniture changed around or knocked over. The child was adamant that the doll had done it. When Eugene died in 1974 the doll was left in the attic, a new family with a ten year old girl became Robert’s new owner. It wasn’t long before she began to report a similar story and 30 years later maintains that the doll was alive and wanted to kill her. If you go to visit Robert and want to take a picture you need to be sure to ask him first. If he does not agree his head tips to one side, if you should still take a picture the doll will curse you and your family. Don’t say I haven’t warned you!